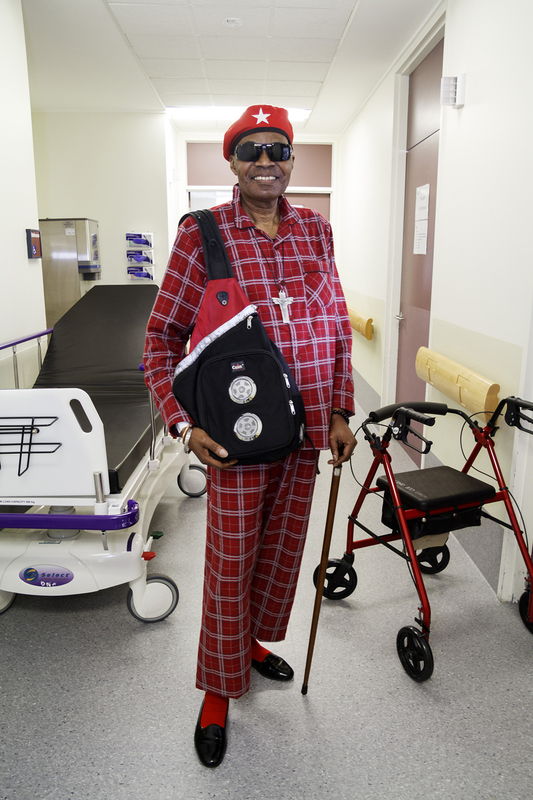 The P J Kool images were made while the late Congolese musician Passi Jo was undergoing treatment for cancer at St Vincent’s Hospital in Melbourne, Australia, his adopted home. Passi Jo’s Congolese heritage, his affinity for dressing well and the unfortunate circumstances that necessitated him virtually living in his pyjamas for most of 2016, gave rise to this unique project. We collaborated to create a series of playful images referencing La Sape, a sub-cultural movement that Passi Jo was a part of in his homeland and in Paris. Having been embraced by the Congolese community via marriage, it provided me, as his wife, with an opportunity to highlight this ‘cloth’ movement. Followed mostly by urban men, it is little-known locally but representative of many in the Congolese community in Australia and abroad. La Sape is an acronym for the Society for the Advancement of People of Elegance, from the French La Societé des Ambienceurs et des Personnes Elégantes — those who create ambience, the atmosphere-makers. 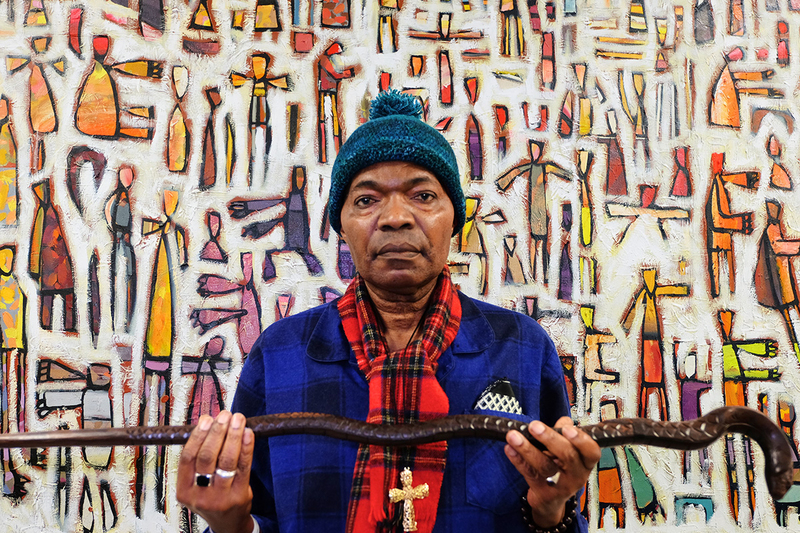 Passi Jo grew up in the Bacongo district of Brazzaville, Republic of Congo, “the true birthplace of Sape, the religion of style” (Daniele Tamagni, Gentlemen of Bacongo, 2009). The movement spread across the Congo River to Kinshasa, Democratic Republic of Congo (DRC, formerly Zaire) and was closely aligned with the Congolese music scene, especially in the 1970s and 80s. Sapeurs work hard to save their earnings so they can dress resplendently in expensive designer attire. This allows them to rise above the harsh daily reality of political, social and economic upheaval from years of civil war and oppression. They don the uniform of the international fashionistas in order to survive and feel inspired. 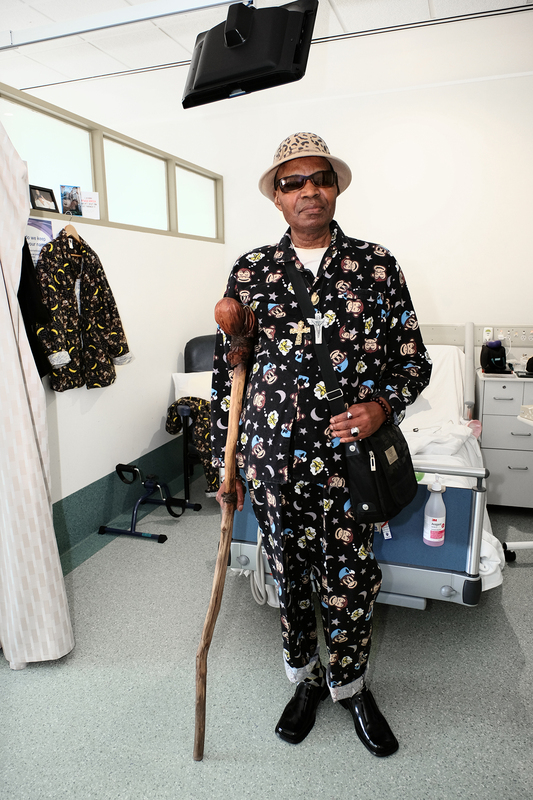 In this spirit, Passi Jo rose from his hospital bed and dressed for the camera to reconnect with and celebrate his culture, and be transported from a life defined by cancer to one of feeling the joy, style and swagger of living again. P J Kool showcases Passi Jo styled-up in checked and somewhat irreverent, politically incorrect pyjamas with affordable K-Mart and Target labels and price tags. Rather than being bed-rumpled, they were well-pressed and accessorised with sunglasses, walking sticks, hats and other flamboyant accoutrements not usually associated with sleepwear, but essential to complete the Sapeur look. Because the pyjamas have the initial appearance of many of the expensive colourfully patterned designer suits worn by the Sapeurs, the images are imbued with a lightness of touch and subtle irony. It is a gentle humour, seeking the attention of audiences with a wish to extend engagement between and within the myriad cultural threads that make up Australia’s “kitendi,” a word meaning fabric in Lingala, a Bantu language of the Congo. Participating in the creation of these photographs enabled Passi Jo to share his culture with the hospital staff and other patients. Like the Sapeurs, he created atmosphere, ambience and colour in an often confronting and emotionally fraught medical environment. Though the images were carefully planned, they embody a more organic photographic process common to my work as an independent documenter of live performance, and as the rehearsal photographer with the Melbourne Theatre Company for 15 years. We both felt the strong performative element revealed Passi Jo’s vulnerability as well as his strength under exceptionally distressing circumstances. Sadly, exactly three months after these photographs were made, Passi Jo died. They are a true testament to his mental discipline and courage as he faced increasing physical fragility, and to a life dedicated to the arts of music, performance and personal style. The P J Kool exhibition aligns creativity for both the subject, Passi Jo, and myself as the photographer. It combines illness and creative practice, highlighting the crucial role the arts can play in health and wellbeing, disease and illness. It’s an area of increasing interest for me as an artist, ripe with opportunities for others across the creative spectrum, but particularly in music, and greatly deserving of ongoing and sustained levels of funding and support. This essay by Melbourne artist, photographer and lecturer Pam Kleemann-Passi comes from the catalogue accompanying her exhibition of photographs and memorabilia, P J Kool — Dissecting Culture, Cancer and Cloth which she collaborated on with her partner, the late Passi Jo. For more about the project and Sapeur culture, download the catalogue and visit the exhibition.